Come and join us at one of our three churches, with times and styles to suit all walks of life. 8am Said Eucharist. A quiet spoken service in traditional language. 9.15am Parish Eucharist. A family-friendly service using contemporary language in our beautiful church building. A mix of modern and traditional music. During the sermon, St Alphege Kids meet in the upper chapel. 9.15am The Junction in the Oliver Bird Hall. Especially for families with very young children. It meets in the Church Hall (OBH). The service is in a very informal style with a worship band, and there are groups for all ages. 9.15am All Age Eucharist (2nd Sunday of the month). Between the 9.15 and 11am services all are welcome for coffee and conversation in the Oliver Bird Hall. 11am Choral Eucharist. A formal traditional language service. Our worship is enhanced by the full choir, choral settings, sermon and hymns. During the high feasts and Epiphany and Easter seasons, incense is used. 6.30pm Choral Evensong. Following the Book of Common Prayer with full choir, hymns and a sermon. 8am Eucharist (Order Two). A celebration of Holy Communion in traditional language. 10am Eucharist and Sunday Club for children. In modern language, with a variety of hymns and songs, a sermon, and activities for children. 6.30pm Evening Worship in the chapel. With a healing service on the 2nd Sunday of each month. 9am Eucharist (Order Two); 4pm Jigsaw All Age Worship. 10.30am Eucharist and Sunday Club for children. In modern language, with a variety of hymns and songs, a sermon, and activities for children. Meeting at Sharmans Cross School. Worship led by our world-class choirs, including boys, girls, ladies and men as well as St Alphege Singers, our voluntary choir. You can experience the beauty and joy of their singing at the 9.15am Parish Eucharist several times a month, and especially at the 11am Choral Eucharist every Sunday. We also maintain the English choral tradition in a contemplative setting, through the singing of Choral Evensong at 6.30pm on Sundays and Wednesdays in term time. A quiet, contemplative Eucharist in the peaceful and friendly setting of St Michael’s chapel, Bryanston Road. Celebrated each Wednesday at 10am followed by a time of coffee and conversation. 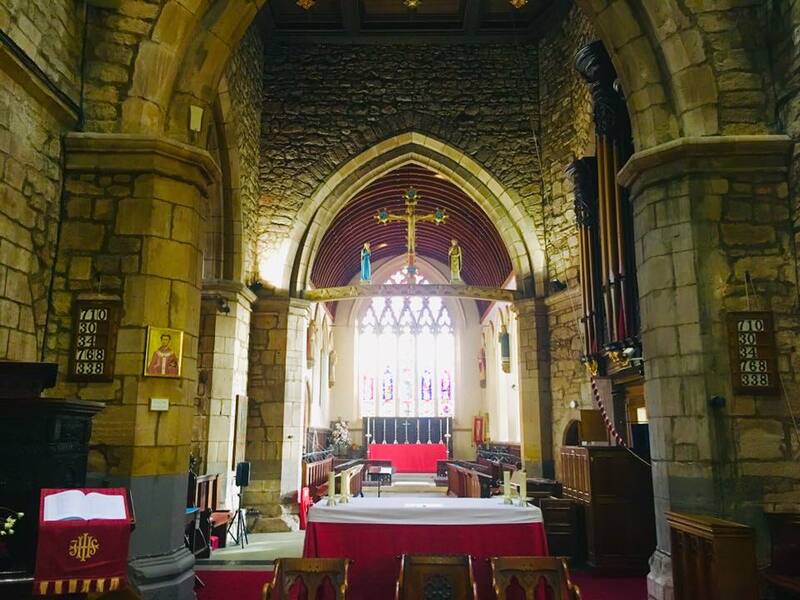 On the 2nd Sunday of the month, the Junction and 9.15 Eucharists are combined for an All Age Eucharist in St Alphege church. A worship band leads us in contemporary songs. Young people often act as servers, and the teaching is especially suitable for children and families. Messy Church meets at St Helen’s Church several times each term. It includes a time of craft, worship, a hot meal and lots of Messy fun for children and their families. To book and find out more look here. Come and reflect in this ancient and holy space. Light a candle, say a prayer, or just rest in God’s presence. The Eucharist is celebrated regularly in church each week (see St Alphege to find out more). You will be made very welcome.